One Day Tour - Departs: 7th & 22nd of each month. This tour departs from the Kampoul Adventure Tour office at 8:00am after meeting with your guide and driver. 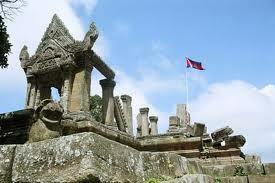 Preah Vihear was listed as a World Heritage site by UNESCO in July 2008. 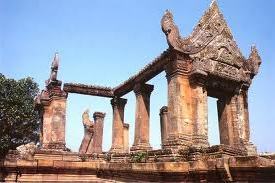 Preah Vihear temple is unusual among Khmer temples in that it was constructed along a long north-south axis, rather than having the conventional rectangular plan with orientation toward the east. As a key edifice of the empire's spiritual life, it was supported and modified by successive kings and so bears elements of several architectural styles. This ancient Hindu temple built during the reign of the Khmer Empire is situated atop a 525-metre cliff in the Dângrêk Mountains. 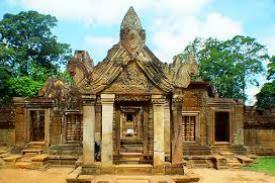 It's location awards it the most spectacular setting of all the temples built during the six century Khmer Empire. It allows views for kilometres across the plains below. In 1962, following a lengthy dispute between Thailand and Cambodia over ownership, the International Court of Justice (ICJ) in The Hague ruled that the temple is in Cambodia. Return to Siem Reap for dinner and Apsara Dance Show. Tour also includes lunch. One Day Tour - Departs: 8th & 23rd of each month. 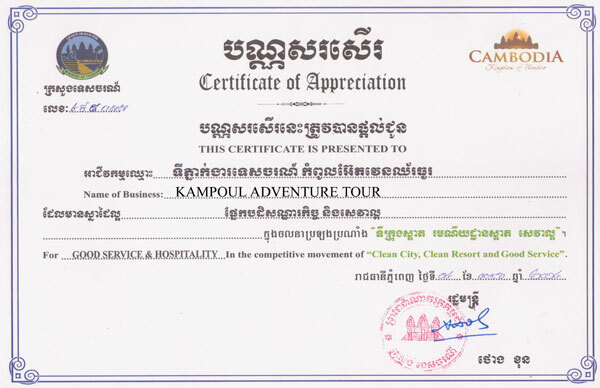 This tour departs from the Kampoul Adventure Tour office at 8:00am after meeting with your guide and driver. 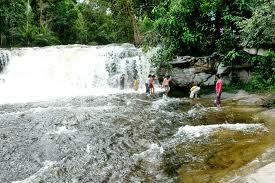 The tour departs for an archaeological site on the south west slopes of the Kulen hills known as Kbal Spean. The site is situated along a 150m stretch of the Stung Kbal Spean river and is roughly 25 kms from the main Angkor group of monuments. The area is commonly known as the "River of a Thousand Lingas" or "Valley of 1000 Lingas". The site consists of a series of carvings in the sandstone banks and river bed only centimetres below the water surface. The motifs for stone carvings are mainly myriads of lingams (phallic symbol of Hindu god Shiva), depicted as neatly arranged bumps that cover the surface of a sandstone bed rock, and lingam-yoni designs. There are also various Hindu mythological motifs, including depictions of the gods Shiva, Vishnu, Brahma, Lakshmi, Rama, and Hanuman, as well as animals (cows and frogs). Here the tour takes a break for lunch before heading back in the afternoon to explore Banteay Srei temple and Banteay Samre temple. Banteay Srei temple, the pink sandstone construction temple was built by king Rajendravarman V in late 10th century. The walls of Banteay Srei temple itself are densely covered with some of the most beautiful, deep and intricate carvings of any Angkorian Temple. Banteay Samré temple is located east of the East Baray. Built under Suryavarman II and Yasovarman II in the early 12th century. 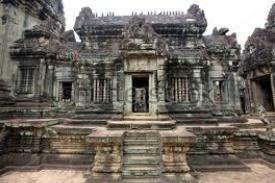 It is a Hindu temple in the Angkor Wat style, named after the Samré an ancient people of Indochina. 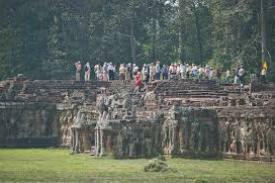 The temple uses the same materials as the Banteay Srei. Back to Siem Reap for dinner and Apsara Dance Show. Tour also includes lunch. One Day Tour - Departs: 9th & 24th of each month. This tour departs from the Kampoul Adventure Tour office at 8:00am after meeting with your guide and driver. 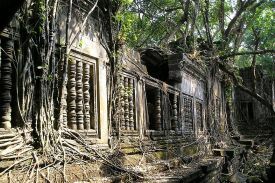 This tour firstly heads for the Hindu temple Beng Mealea. Even though this temple is a Hindu temple you will also notice Buddhists motifs in the carvings. The primary material used in its construction was sandstone and remains largely unrestored. Trees and thick bush thrive amidst the towers and courtyards while many of its stones lay in great heaps. 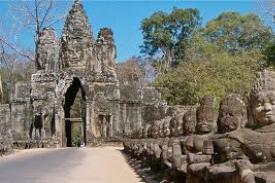 The site lies approximately 77km form Siem Reap and was originally very hard to reach. However more visitors are now able to access the site due to a new road which passes Beng Mealea for the temple complex of Koh Ker. After a break for lunch the tour heads off to the Floating Forest (Kompong Phluck). A village located 25km east of Chhlong Kneas and only accessible by boat. Many consider Kompong Phluk more interesting than Chhong Kneas because of its “floating forest”. Kompong Phluk also differs from Chhong Kneas because its people live in houses surrounded by water. Chhong Kneas is a floating community that lives on boats. Back to Siem Reap for dinner with Apsara Dance Show. Tour also includes lunch. One Day Tour - Departs: 10th & 25th of each month. This tour departs from the Kampoul Adventure Tour office at 8:00am after meeting with your guide and driver. The first stop on this tour is Sambor Prei Kuk. 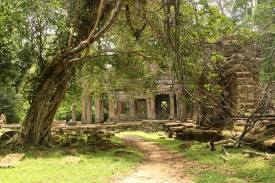 A pre Angkorian temple complex situated 30 kilometres north of the town, Kampong Thong. 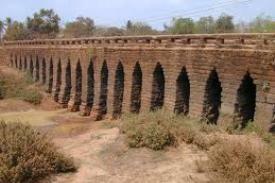 It was also previously known as Isanapura and was the capital of the Chenla Kingdom. 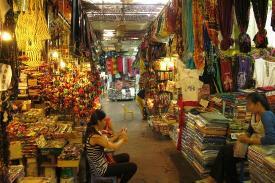 It is close to the Sen River and located on the eastern bank of Tonle Sap. the tour will take a break here for lunch. Once lunch is finished the tour will begin again and see the Kompong Kdei Bridge on the way back to Siem Reap. 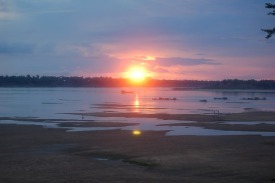 After that, visit Kompong Khleang, located on the northern lake-edge about 55 km east of Siem Reap. This area is more remote and attracts less tourist than Kompong Phluk. Visitors to Kampong Khleang during the dry season are universally awestruck by the forest of stilted houses rising upto 10 meters in the air. In the wet season the waters rise upto within one or two meters of the buildings. Like Kompong Phluk, Kompong Khleang is a permanent community within the flood plains of the Lake and an economy based on fishing and surrounded by the flooded forest. But Kompong Khleang is significantly larger with nearly 10 times the population of Kompong Phluk, making it the largest community on the Lake. Back to Siem Reap for dinner with Apsara Dance Show. Tour also includes lunch. One Day Tour - Departs: 11th & 26th of each month. This tour departs from the Kampoul Adventure Tour office at 8:00am after meeting with your guide and driver. Banteay Srei temple is a pink sandstone construction built by king Rajendravarman V in the late 10th century. this will be your first stop.T he walls of Banteay Srei temple are densely covered with some of the most beautiful, deep and intricate carvings of any Angkorian Temple. Following this will be the Roluos group (Hariharalaya). This includes the Preah Ko temple erected by Indravaravan I in the late 9th century and dedicated to the king and his ancestors in 880. Bakong temple the largest and the most interesting of the Rolous Group of temple. This is an active Buddhist monastery just to the north of the east entrance and the four brick towers of Lolei temple. 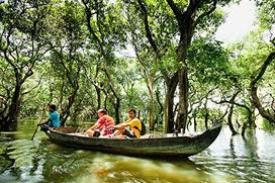 After that, go to the Floating Forest (Kampong Phluck). 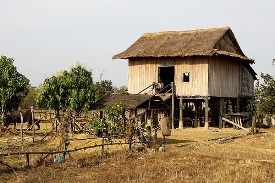 A village located 25km east of Chhlong Kneas and only accessible by boat. Many consider Kompong Phluk more interesting than Chhong Kneas because of its “floating forest”. 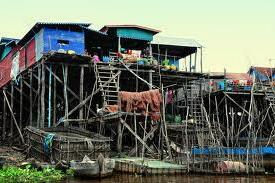 Kompong Phluk also differs from Chhong Kneas because its people live in houses surrounded by water. Chhong Kneas is a floating community that lives on boats. Back to Siem Reap for dinner with Apsara Dance Show. Tour also includes lunch. One Day Tour - Departs: 12th & 27th of each month. This tour departs from the Kampoul Adventure Tour office at 8:00am after meeting with your guide and driver. 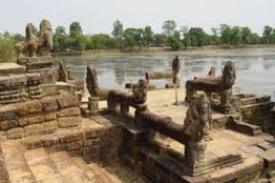 This tour firstly heads for the Hindu temple Beng Mealea. Even though this temple is a Hindu temple you will also notice Buddhists motifs in the carvings. The primary material used in its construction was sandstone and remains largely unrestored. Trees and thick bush thrive amidst the towers and courtyards while many of its stones lay in great heaps. 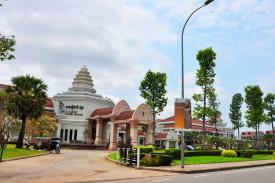 The site lies approximately 77km form Siem Reap and was originally very hard to reach. However more visitors are now able to access the site due to a new road which passes Beng Mealea for the temple complex of Koh Ker. There will be a break for lunch before visiting Koh Ker temple. This remote archaeological site in northern Cambodia is about 120 kilometres away from Siem Reap and the ancient site of Angkor. It is a jungle region that is sparsely populated. More than 180 sanctuaries were found in a protected area of 81 square kilometres (31 sq mi). However only about two dozen monuments can be visited by tourists because most of the sanctuaries are hidden in the forest and the whole area is not fully free of land mines. Back to Siem Reap for dinner with Apsara Dance Show. Tour also includes lunch. One Day Tour - Departs: 13th & 28th of each month. This tour departs from the Kampoul Adventure Tour office at 8:00am after meeting with your guide and driver. Banteay Srei temple is a pink sandstone construction built by king Rajendravarman V in the late 10th century. this will be your first stop.T he walls of Banteay Srei temple are densely covered with some of the most beautiful, deep and intricate carvings of any Angkorian Temple. then off to the Hindu temple Beng Mealea. Even though this temple is a Hindu temple you will also notice Buddhists motifs in the carvings. The primary material used in its construction was sandstone and remains largely unrestored. Trees and thick bush thrive amidst the towers and courtyards while many of its stones lay in great heaps. 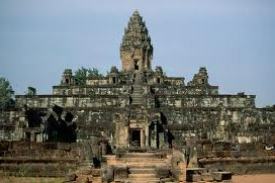 The site lies approximately 77km form Siem Reap and was originally very hard to reach. However more visitors are now able to access the site due to a new road which passes Beng Mealea for the temple complex of Koh Ker. After a break for lunch head for Kampong Khleang, located on the northern lake-edge about 55 km east of Siem Reap. This area is more remote and attracts less tourist than Kampong Phluk. Visitors to Kampong Khleang during the dry season are universally awestruck by the forest of stilted houses rising upto 10 meters in the air. In the wet season the waters rise upto within one or two meters of the buildings. Like Kompong Phluk, Kompong Khleang is a permanent community within the flood plains of the Lake and an economy based on fishing and surrounded by the flooded forest. But Kompong Khleang is significantly larger with nearly 10 times the population of Kompong Phluk, making it the largest community on the Lake. Back to Siem Reap for dinner with Apsara Dance Show. Tour also includes lunch. One Day Tour - Departs: 14th & 29th of each month. This tour departs from the Kampoul Adventure Tour office at 8:00am after meeting with your guide and driver. The tour departs for an archaeological site on the south west slopes of the Kulen hills known as Kbal Spean. The site is situated along a 150m stretch of the Stung Kbal Spean river and is roughly 25 kms from the main Angkor group of monuments. The area is commonly known as the "River of a Thousand Lingas" or "Valley of 1000 Lingas". The site consists of a series of carvings in the sandstone banks and river bed only centimetres below the water surface. The motifs for stone carvings are mainly myriads of lingams (phallic symbol of Hindu god Shiva), depicted as neatly arranged bumps that cover the surface of a sandstone bed rock, and lingam-yoni designs. There are also various Hindu mythological motifs, including depictions of the gods Shiva, Vishnu, Brahma, Lakshmi, Rama, and Hanuman, as well as animals (cows and frogs). Here the tour takes a break for lunch before heading back in the afternoon to explore Beng Mealea. Even though this temple is a Hindu temple you will also notice Buddhists motifs in the carvings. The primary material used in its construction was sandstone and remains largely unrestored. Trees and thick bush thrive amidst the towers and courtyards while many of its stones lay in great heaps. 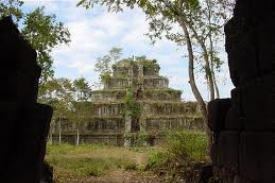 The site lies approximately 77km form Siem Reap and was originally very hard to reach. 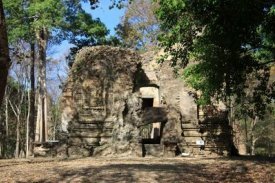 However more visitors are now able to access the site due to a new road which passes Beng Mealea for the temple complex of Koh Ker. Return to Siem Reap for dinner with Apsara Dance Show. Tour also includes lunch. Phnom Kulen is considered a holy mountain in Cambodia, of special religious significance to Hindus and Buddhists who come to the mountain in pilgrimage.It also has a major symbolic importance for Cambodians as the birthplace of the ancient Khmer Empire, for it was at Phnom Kulen that King Jayavarma II proclaimed independence from Java in 804 CE. Jayavarman II initiated the cult of the king, a linga cult, in what is dated as 804 CE and declaring his independence from Java of whom the Khmer had been a vassalage state (whether this is actually "Java" or "Lava" (a Lao kingdom) is debated, as well as the legend that he was earlier held as a ransom of the kingdom in Java. See Higham's The Civilization of Angkor for more information about the debate). 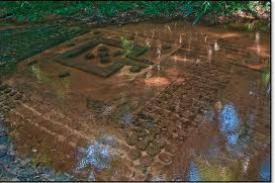 During the Angkorian era the relief was known as Mahendraparvata (the mountain of Great Indra). Break for lunch then Kampong Khleang, located on the northern lake-edge about 55 km east of Siem Reap. This area is more remote and attracts less tourist than Kampong Phluk. Visitors to Kampong Khleang during the dry season are universally awestruck by the forest of stilted houses rising upto 10 meters in the air. In the wet season the waters rise upto within one or two meters of the buildings. Like Kompong Phluk, Kompong Khleang is a permanent community within the flood plains of the Lake and an economy based on fishing and surrounded by the flooded forest. But Kompong Khleang is significantly larger with nearly 10 times the population of Kompong Phluk, making it the largest community on the Lake. Back to Siem Reap for dinner with Apsara Dance Show. Tour also includes lunch.